One and Two Potomac Yard represent one of the first "green," new speculative office building projects in the Washington, DC area. The project is located on a formerly abandoned railroad yard in Arlington, Virginia. Within this urban setting, the two twelve-story buildings total 654,000 SF and consist of office and retail spaces as well as a fitness center for use by building occupants. One and Two Potomac Yard has earned LEED (Leadership in Energy and Environmental Design) Green Building Rating System® Gold for New Commercial Construction (NC) certification. Construction of the buildings began in 2004 and was completed in May 2006. Recognizing the complexity of the project, Crescent Resources, LLC, the developers, set out to form a team of experienced professionals to develop designs for their first class buildings. Early on, they involved an Environmental Building Consultant and a Commissioning Authority to educate the design team about sustainable design and provide assistance on potential LEED items. Throughout the delivery process, they were also forthcoming with information, which helped foster a cooperative relationship with the lessee, the U.S. General Services Administration (GSA), and the lead tenant, the U.S. Environmental Protection Agency (EPA) in the review of the project. As a result, One and Two Potomac Yard exemplify a balance of function, cost, security, and sustainability. Sustainable landscaping on the north side under the overpass for Reagan National Airport. As the first project at the Potomac Yard site, which is a significant gateway to Ronald Reagan National Airport and nearby Washington, DC, the developers of One and Two Potomac Yard wanted to set the right tone for future developments at Potomac Yard. They aimed to create architecturally distinctive, first class, high quality, sustainable design that would provide an inviting, dignified, and professional image, reflecting the values of the federal government tenants they were appealing to. In order to accomplish this goal, the project team and stakeholders, including GSA and EPA had to work together to resolve a multitude of issues, including balancing Arlington County's requirements for accessibility/openness and active street fronts within their urban design guidelines and GSA's requirements for security and the developers desire to keep control of costs. Secure/Safe Goal: While this project was approved for development in August 2001, the terrorist attacks on September 11, 2001 brought security requirements to the forefront. The project team responded by revising the design to meet new Federal Protective Services requirements for Level 4 security. 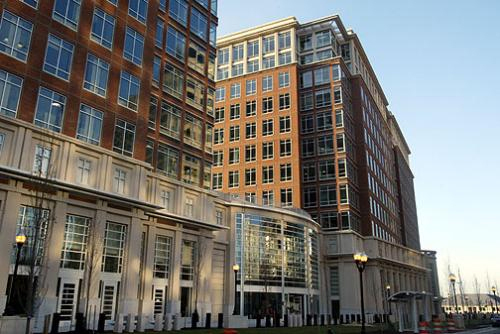 Sustainable Goal: With the lease award by GSA in 2004, new sustainability criteria—such as LEED Silver certification and Energy Star® certification—were required of the project, else the developers faced penalty equal to 10% of the annual rental payments due for the GSA/EPA–leased spaces. The developers went beyond these minimum requirements and achieved LEED Gold-NC certification for One and Two Potomac Yard. Functional Goal: As speculative office buildings, creating functional and adaptable work environments with reliable technology infrastructure that would easily accommodate spatial and organizational changes were very important. To address energy and security issues, an emergency generator was installed to provide power to only critical systems in cases of blackouts, brown outs, or other disruptions in the electrical service. Accessible Goal: The accessibility goal was to comply with all local, state, and federal requirements (i.e., Americans with Disability Act [ADA] and Architectural Barriers Act [ABA]). Aesthetic Goal: The developers wanted to create architecturally distinctive, high quality, sustainable buildings that would provide an inviting, dignified, and professional image, reflecting the values of the federal government tenants they were appealing to. Cost-Effective Goal: While the developers made additional investments to comply with—and in some cases exceed—GSA and EPA requirements, they saw the potential marketing value and operational savings of creating sustainable, high-quality, durable buildings. Productive Goal: To create effective work environments, GSA/EPA and the developers placed importance on designing healthy and thermally, visually, and acoustically comfortable spaces. Required metrics included compliance with all aspects of ASHRAE 62-1999, Ventilation for Acceptable Indoor Air Quality, Addenda 2001; development and use of IAQ Management Plan; limits on VOC content of products; compliance with ASHRAE 55-1992, Addenda 1995 for thermal comfort; and installation of a permanent temperature and humidity monitoring system configured to provide operators control over thermal comfort, including humidification. Daylighting was maximized by stepping offices back from exterior windows and creating open plan spaces. The spaces were also designed for flexibility in office arrangement infrastructure and connectivity. Conference area with abundant daylight and views of the Potomac River and airport with energy efficient, double-glazed windows. One and Two Potomac Yard are complex mixed-use projects that required extensive coordination and cooperation among the stakeholders—developers (Crescent Resources LLC), their design and consulting team, their contractors, the lessee (GSA), the primary tenant (EPA), and the local government entity (Arlington County)—throughout the development process. Using this integrated team approach, it was possible to establish common goals and reconcile various—and sometime conflicting—requirements by GSA, EPA, USGBC (for LEED certification), Federal Protective Service (for security), and Arlington County. To ensure that the buildings operate optimally throughout their lives after construction, the buildings were commissioned, permanent monitoring systems were installed, operations and maintenance requirements were defined, and post-occupancy activities were identified prior to occupancy. Crescent Resources LLC, the developers, selected the Potomac Yard site on an abandoned railroad yard because of its central location within Arlington County and proximity to services and existing infrastructure, including public transportation and utilities. This decision fits well with one of Crescent Resources' corporate goals of caring for the environment and the communities it serves. Furthermore, Crescent Resources agreed to agree to comply with Arlington County's Phase Development Site Plan Conditions to have the projects be certifiable through the USGBC LEED rating system. Thus, from the beginning, One and Two Potomac Yard were planned to be sustainable buildings. Also, as the first development on the site, Crescent Resources wanted to set a positive tone for Potomac Yard by creating first class, high quality, distinctive buildings, which could reinforce Potomac Yard's Crystal City's position as the gateway to the nation's capital. However, as an abandoned railroad yard, there were a lot of concerns about the environmental risk associated with soil contamination. In fact, when Jack Kent Cook retracted his plans for a new Redskins stadium at the Potomac Yard site in 1992, he stigmatized development there by announcing that the overwhelming environmental problems would keep him from building the stadium. These concerns were mitigated prior to site acquisition when Crescent Resources confirmed that EPA oversaw remediation of the site and verified the "no further action" letters issued by EPA and the Virginia Department of Environmental Quality. GSA awarded the lease to Crescent because the Potomac Yard site met the Solicitation for Offers requirements which stated that the leased space "shall be located in a prime commercial office district with attractive, prestigious, professional surroundings with a prevalence of modern design and/or tasteful rehabilitation in modern use." During the pre-design stage, Crescent Resources agreed to comply with Arlington County's Phased Development Site Plan Conditions and Design Guidelines. Initially One and Two Potomac Yard met the requirements for 17 credits. During this early stage of the delivery process, the Arlington County Board Chairperson recognized the complexity of the site plan and building permit process and assigned an Assistant County Manager to oversee the Potomac Yard development process. The Assistant County Manager held monthly meetings to bring together the various County departments and the developer team to review the issues and challenges facing the projects. Responding to the complexity of the project, Crescent Resources set out to form a team of experienced professionals to develop designs for their first class buildings. Early on, in response to the Solicitations for Offer (SFO) put out by the EPA, they involved an Environmental Building Consultant to educate the design team about sustainable design and provide assistance on potential LEED items. A Building Commissioning Authority was hired to guide the team through both the design and construction stage commissioning process, beginning with defining the developers' performance requirements for the buildings' systems and equipment. Also, Crescent Resources procured pre-construction services from construction contractors to provide input on the system designs, pricing, constructability, and timing. Engaging the integrated design process, the design team completed the design for One and Two Potomac Yard in August 2001 based on new urbanism principles and gained Arlington County approval for the projects soon thereafter. The terrorist attacks on September 11, 2001, led to new security requirements for all GSA leases that conflicted with Arlington County's new urbanism. For example, new urbanism promotes multiple pedestrian and vehicular access points to buildings and destinations, but post-September 11th security requires limited and controlled access points. The street level retail activity conflicted with limited street access to the buildings. Moreover, Arlington's Urban Design Guidelines required an active streetscape and no setbacks; new security guidelines require setbacks of 50 to 100 feet. To meet the security requirements of the Potomac Yard lease with GSA, major changes had to be made to the design. Locker and shower facilities for bicyclists. In addition to the security revisions the lease awarded by the U.S. General Services Administration (GSA) in May 2004, major changes had to be made to the design to accommodate GSA's new requirements for sustainability which were more stringent than the developer's original plan. These included: minimum LEED Silver certification instead of LEED certifiable projects, indoor air quality testing, limiting levels of volatile organic compounds in building materials, building energy-cost savings of 20% and an Energy Star® building label, recycled-content products according to EPA's Comprehensive Procurement Guidelines (CPG), construction waste management, standards of performance for heating, ventilating, and air-conditioning systems, bicycle storage and changing and shower facilities, and recycling rooms. Retrofitting the projects to incorporate LEED requirements after obtaining zoning approval from Arlington County complicated the project's design process. However, by readily disclosing information and involving the U.S. Environmental Protection Agency (EPA)—the lead tenant for the buildings—and the GSA in discussions with the designers and contractors throughout the re-initiated design stage, all parties were able to cooperate and work together to achieve their respective goals. The project team learned that the project goals (including LEED certification) should be set at project inception; that the team should have frequent coordination meetings starting early in the process (including meetings focused on specific topics like LEED and security); and that the team should begin documenting LEED strategies early on. Examples of collaborative design solutions include: installation of plasma televisions behind the windows, facing out from the first floor conference room in One Potomac Yard to liven the streetscape while providing the interior meeting space needed by EPA; and reinforcement of site furniture which serves as both furniture and bollards to provide access control and perimeter protection. Related to functionality and workplace productivity as well as energy and security, an emergency generator was installed in One and Two Potomac Yard as an emergency back-up in cases of blackouts, brown outs, or other disruptions in the electrical service. The generators have the capacity to provide power to all critical systems (i.e., alarm systems, CCTV monitoring devices, fire detection systems, entry control devices, emergency and security lighting systems, and computer data centers). Commissioning: A Commissioning Authority (CxA) was engaged early in the project process. As required by the Solicitation for Offers, the CxA provided a Design Stage Commissioning Plan as part of the developers' submission package. Once the project was awarded to Crescent Resources, the Design Stage Commissioning Plan was fleshed out throughout the Design Stage and re-released in final form as a Construction Stage Commissioning Plan. The Design Stage Commissioning Plan focused on assuring the owner's performance requirements are incorporated and properly integrated in the prepared and accepted construction documents. Details of systems tests and procedures, assembly-specific checklists, and testing and documentation responsibilities were incorporated in Construction Stage Commissioning Plan as well as the projects' construction specifications. As part of the requirements for LEED credit EA3, Additional Commissioning, the CxA was responsible for reviewing design prior to construction documents and reviewing the construction documents prior to contract documents. Because the construction contractors were involved in the projects during the Design Stage, the transition from design to construction was mostly seamless. At the beginning of construction, a partnering session was conducted with the major stakeholders, construction contractors, and their primary subcontractors to define communication protocols, and to ensure that everyone understood the goals of the projects. This helped to build cooperative, constructive working relationships among the team members. Nevertheless, the project team did encounter a number of challenges during the Construction Stage. One of the lessons learned during the Construction Stage was that pursuing LEED certification adds time to the construction process. For example, certain LEED credits made material specification more complicated than for a typical project because it necessitated more research. It also required taking the time to educate the subcontractors about the importance of LEED materials and installation requirements. For example, IAQ requirements for carpet air out might seem arbitrary to a carpet installer; however, carpet air out affects IAQ and passing IAQ testing drives GSA's acceptance of the building. Crescent Resources learned that selecting design team members and subcontractors with LEED experience is essential to minimize the extra time required to achieve LEED certification. Another challenge during this stage was enforcement of the implementation of LEED requirements. Some subcontractors were lax with requirements because they did not understand the complexities and interrelationships of LEED requirements. As a result, a quality control program, with frequent field inspections, was established to ensure achievement of LEED requirements. Finally, one of the interesting challenges was to balance efficient construction practices and construction waste recycling requirements. Efficient construction operations depends on keeping a site free of debris and waste, but recycling requires maintaining and sorting piles of waste materials. The project team learned to use dumpster management techniques to meet recycling goals and to minimize the disruption of the construction process caused by waste hauling. Commissioning: The major commissioning activities occurred during construction. The CxA worked with the contractors to test/witness/accept systems and equipment, ensuring that the installed systems and equipment meet the developers' performance requirements. The CxA reviewed submittals relative to systems being commissioned. The CxA also oversaw training of O&M staff, which is critical to the proper operations and maintenance of the buildings. Crescent Resources also executed a contract with the CxA to review building operation procedures and performance with the O&M staff one year after construction completion. The Operations and Maintenance Stage just began for One and Two Potomac Yard. In anticipation of the O&M Stage of the projects, a Green Housekeeping Plan was developed to ensure that housekeeping practices would not adversely affect the level of sustainability initially achieved by the buildings. The Green Housekeeping Plan details such items as the types of cleaning products to be used and the isolation requirements for construction near occupied spaces. Also, a User Education Program, which includes signage, was developed to inform building occupants and visitors about the sustainable features of the buildings and how to use them properly. Integrated into the environmental control system are permanent temperature and humidity monitoring system and permanent carbon dioxide monitoring system. These systems provide feedback to the O&M staff so that operational adjustments can be made to ensure indoor environmental quality and comfort for building occupants. Per EPA's requirements, metering equipment was installed for the following end-uses, including lighting systems and controls, motor loads and operations, building-related process energy systems and equipment, and water service systems, for One Potomac Yard. This will allow EPA to continually monitor the building's performance so they can work with the O&M staff to optimize the energy and water consumption performance of the building. Function, security, sustainability, and costs were drivers for making material and system decisions at One and Two Potomac Yard. In addition, LEED requirements and EPA-specific requirements had to be adhered to. Comply with Volatile Organic Compound standards, as listed in the Solicitation for Offers (SFO), for materials such as adhesives, sealants, caulks, paints, coatings, carpet systems, and wood products. To ensure procurement of products with the required green characteristics, the environmental building consultant developed "green" specification language that was included in the construction specifications and drawings as appropriate. The environmental building consultant also worked with the tenant's team to ensure that the interior specifications also complied with EPA and LEED requirements. Another level of oversight was provided through the review of product submittals by both the developer team and/or the lessee/lead tenant. Wheat board counter with laminated top. In addition, each building has a dedicated recycling area (approximately 500 SF) in the loading dock for collection and separation of paper, corrugated cardboard, glass, plastics, and metals to reduce the waste generated by building occupants that is disposed of in landfills. Related to function, durability, and workplace productivity, the modular furniture system used in the office spaces was chosen for its ease of assembly and disassembly, which facilitates reusability and reduces churn costs. In addition, the carpet tile by Interface can be recycled and manufactured into new carpet tiles. In order to reduce the energy-related impacts of One and Two Potomac Yard, Crescent Resources engaged an experienced design team to design these energy-efficient buildings. The developers also engaged an independent commissioning agent to ensure that the energy-using systems were designed, installed, functionally tested, and capable of operation and maintenance according to the owner's needs. To achieve energy cost savings of 20% over ASHRAE 90.1 1999 as required by EPA, the designs of One and Two Potomac Yard had to incorporate the following: lighting-power densities that fall between 0.74 and 0.9 watts per square feet; high-performance window and entry systems that maximize thermal performance, reduce solar gain, and minimize air leaks and uncontrolled water infiltration; light-colored materials that maximize the effect of daylight and reduce energy use and heat gain from artificial light sources; building management control systems that monitor carbon dioxide, humidity, and temperature and that control air movement and temperature; and high-efficiency HVAC systems. Moreover, the HVAC and refrigeration equipment and fire suppression systems at One and Two Potomac Yard are free of ozone depleting substances like HCFCs and Halon. Due to EPA requirements, continuous metering equipment was installed for various end-uses, including lighting systems and controls, motor loads, HVAC system loads and operations, building-related process energy systems and equipment, and water service systems in One Potomac Yard only. EPA has also agreed to purchase grid-source green power for both buildings for one full year or 50% of the green power costs for two years. Energy modeling results using eQUEST 2.55 indicate the following savings over ASHRAE 90.1-1999: 23.5% for One Potomac Yard and 20.7% for Two Potomac Yard. Also, the Energy Star® scores (using Energy Star® Target Finder tool) for One and Two Potomac Yard are 85 and 82 respectively. As a pre-construction simulation, the energy model is a prediction subject to changes in actual operation. One and Two Potomac Yard was constructed with an emphasis on providing high-quality, interior environments for all users. This starts during the design stage with proper specification of low-emitting materials and design of ventilation and monitoring equipment; then during the construction stage with the development and implementation of an IAQ Management Plan; then during the pre-occupancy stage with an IAQ testing plan; then finally with the occupancy stage with the implementation of a green housekeeping plan. The success of One and Two Potomac Yard was a result of cooperation and teamwork between the developers (Crescent Resources) and their contractors/consultants, the lessee (GSA), the tenant agency (EPA), and the local government (Arlington County). Once the lead tenant was identified, it was critical come together and work towards common goals, including sustainability (minimum of LEED Silver rating) and security. The results are two distinctive, quality, high-performance, LEED Gold NC for One and Two Potomac Yard, secure, and accessible office buildings that will serve as models for present and future developments at the Potomac Yard site. Following are some of the lessons learned by the project team in overcoming the challenges of creating One and Two Potomac Yard, particularly in regards to the LEED certification process. Various stakeholders (i.e., USGBC, EPA, Federal Protective Services, and Arlington County, etc.) have conflicting requirements. To overcome this, the project team learned to realistically assess requirements and address requirements accordingly. Executing a success project requires teamwork. At One and Two Potomac Yard, readily disclosing information created a positive, cooperative, productive relationship between the developers, GSA, and EPA. This allowed them to resolve issues and conflicts effectively. Pursuing sustainability, LEED certification, and security requires careful planning. The goals of the project, including LEED certification, should be set at project inception, the team should have frequent coordination meetings starting early in the process, and the team should begin documenting LEED strategies early on. Otherwise, as was experienced on this project, retrofitting the project to incorporate LEED and security requirements after obtaining zoning approval from Arlington County unduly complicated the process. Pursuing LEED certification adds time to the construction process and increases design/engineering fees. At One and Two Potomac Yard, LEED-related design costs were about 33% of the corresponding LEED-related construction costs (design costs are typically around 3–4% of construction costs). Enforcing implementation of requirements, including LEED, during construction is difficult. Crescent Resources learned that a quality control program, including frequent field inspections, is critical to successfully implementing the project's requirements. Embracing the complexity of urban mixed-use projects will mitigate obstacles. There are more variables than equations, and some of the variables are random. The complexity cannot be controlled or reduced. Embracing complexity allowed the project team to attempt rational decision-making without getting frustrated by the lack of resolutions.